It then leaps forward to the Mughal era, where Akbar is reigning over India. He is a practical, pragmatic and a visionary ruler. He has managed to get most of the country under his control. Asaf Baig of Khandesh loathes Akbar with every breath and he knows that to win the allegiance of all anti-Akbar troops, the treasure of Kafur is his key. It will make him indestructible, presenting him with the largest army. Only an old woman called Ambu knows the whereabouts of this treasure that Asaf Baig seeks, so he kidnaps her, leaving her grandson Datta alive. Datta begins a quest to find is grandmother and prevent Asaf Baig from acquiring this treasure. And only ally he can count on is Akbar. In between the quest for the treasure, the characters are caught in a whirlpool of events which will forever change the course of their life. This story has fiction and fact, with a layer a fantasy over it. The book, as the author mentions, is partly true when concerning the facts. The treasure itself is a fact of history. Akbar’s character is kept true, and details such as his marriage to Jodha and his illiteracy are true, as are the threats from Khandesh. Each character is well etched out and nicely detailed. The author Aroon Raman’s first book The Shadow Throne, is a national best seller. He is a Bengaluru based entrepreneur. His research and innovation company works in the area of materials science and has won critical acclaim for developing scientific talent at the grass-roots level. He divides his spare time between trekking, advising and supporting NGOs and travel. 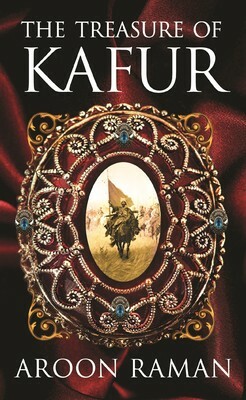 The Treasure of Kafur is a perfect blend of history and mystery, with adventure added to taste. Makes a good weekend read.